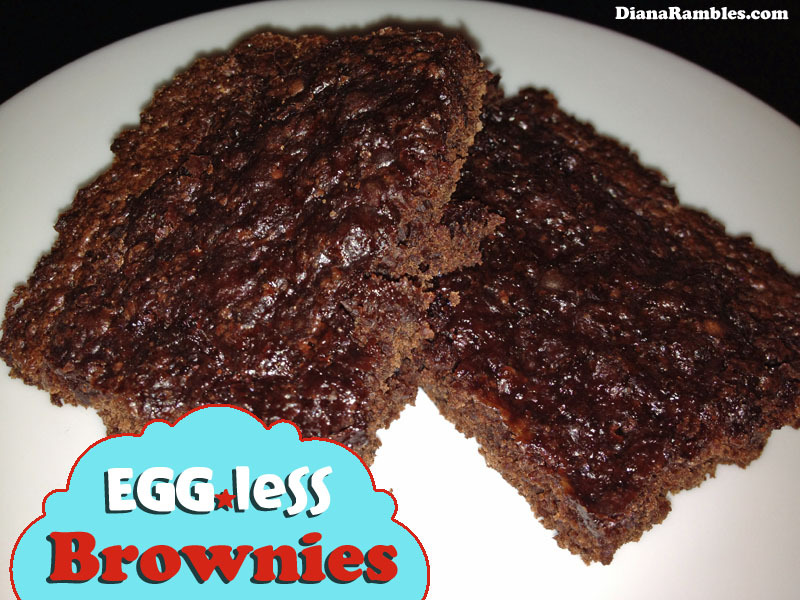 The other day I tasted some egg-less brownies that a friend made with diet coke. They were very cake-like but with some chewiness. We had a Sprite on hand so we decided to try it out. 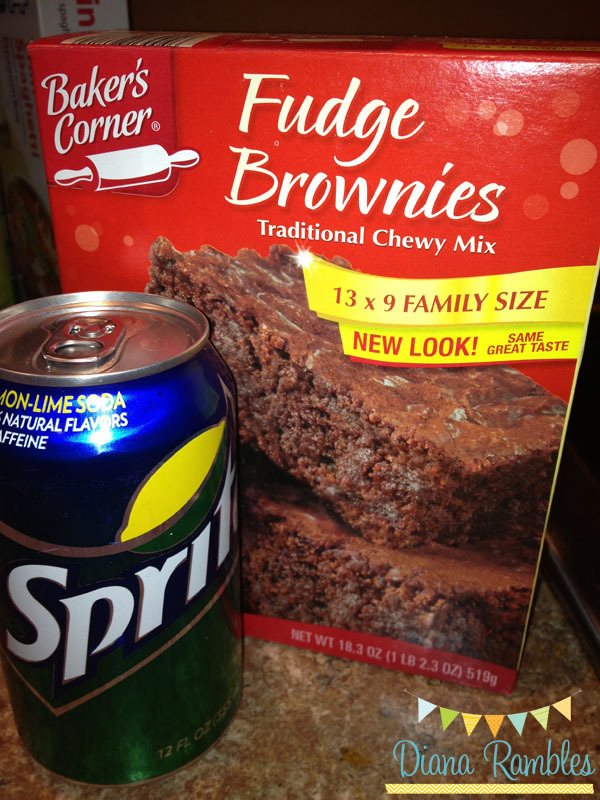 All you need is 2 ingredients: a can of soda and a brownie mix. Mix them up and bake according to the package directions. We used half a can and put ours in a 9×13, so they were a little more dense but still chewy. Some people might not like the texture, but I think it’s a good alternative for people that have to avoid egg. If you want it more fluffy, use the entire can. Ok the challenge is on. Diet Coke? Diet Dr Pepper? We could try all of these combinations! Thanks for sharing. I think *ANY* soda would work!! I've made these before and they are great! I use diet coke so that I'm not adding more sugar to the recipe. Great idea! I have some root beer in my fridge and a box of brownie mix in the pantry. I think I will try this out. Thank you for sharing at my Our Favorite Things Link Party. Have a wonderful Thanksgiving. Fabulous! I rarely use eggs, but love making brownies! This sure works for me. These look so easy and delicious! Cheers. What a great idea! I think it's good to have egg-less recipes on hand and it's even better when they're super easy like this. The bubbles do the trick, from what I understand. Vinegar is another option in place of egg. I had to do this for a special friend once who wasn't allowed egg. It's always good to know. Thanks for visiting and commenting on Amanda's Books and More. I'm already following you via Twitter and FB (Tina Morley). My neighbor does this with cake mix, I guess if you use diet coke and a chocolate cake it is on weight watchers!! I haven't tried brownies yet, if there is chocolate in it I love it. Thanks for linking up! I didn't realize this would work with brownies! I'll have to try it. Thanks for sharing at tip-toe thru tuesday. Nice and so easy! Thanks! Oh, I bet that saves lots of calories,and for me that's a good thing! Thanks for linking up to Think Tank Thursday last week! Oh wow, how simple is that? I have made cake like this, but never thought of brownies. We have an egg allergy, so these will be a nice treat. Thanks for posting. Thanks so much for sharing. My niece and nephew are allergic to eggs, so I've tried this with cake but not brownies! I'm totally gonna have to do this! Thanks so much for linking up and linking back at last week's Humble Brag. Hope to see you back today to link up more great projects and maybe win ad space. We are also starting a giveaway today for a SILHOUETTE CAMEO!! Hope to see you there! Oh, I had heard of using Diet Sprite with cake mixes to save calories. Love this idea. Thank you for sharing at Sharing Saturday!